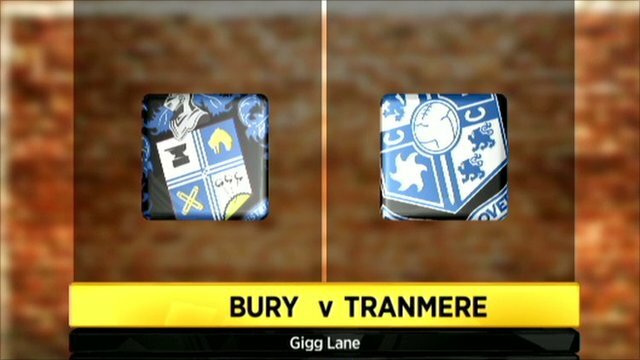 Ian Thomas-Moore fired Tranmere into the area semi-finals of the Johnstone's Paint Trophy at the expense of Bury. Tranmere scored with their first attack of the game as home goalkeeper Ritchie Branagan missed Enoch Showunmi's cross and Thomas-Moore volleyed into the net. Rovers nearly made it 2-0 but John Welsh shot over before a fingertip save from Branagan denied Joss Labadie. Bury had chances to force penalties but Steven Schumacher's free-kick went over and Lenell John-Lewis missed a header. "I haven't had three defeats on the bounce and I didn't want to start now. "We didn't want to go out of two cup competitions in three days so it was really important that we won. "We showed a little bit of resilience, fight and togetherness because towards the end they had a little bit of possession and put a lot of balls into our box." 90:00+3:12 The referee brings the game to a close. 90:00+2:37 Ian Thomas-Moore has a shot on goal from outside the area which misses left. 90:00+1:21 Danny Carlton fouled by Marlon Broomes, the ref awards a free kick. The free kick is swung in right-footed by Steven Schumacher, John Welsh makes a clearance. 90:00+0:39 Joe Skarz is flagged offside by the assistant referee. Indirect free kick taken by Peter Gulacsi. 88:07 Shot on goal by Ian Thomas-Moore from just inside the area goes over the target. 87:02 Peter Sweeney takes a shot. Save made by Peter Gulacsi. 86:10 Joe Skarz crosses the ball, clearance made by Tim Cathalina. 84:30 Free kick awarded for an unfair challenge on Aaron Cresswell by Andy Haworth. Free kick taken by Marlon Broomes. 82:42 Substitution Sammy Morrow joins the action as a substitute, replacing Enoch Showunmi. 81:39 Jermaine Grandison is penalised for a handball. The free kick is delivered right-footed by Steven Schumacher from left channel, Peter Gulacsi makes a save. 80:53 Andy Haworth delivers the ball, save by Peter Gulacsi. 80:27 Outswinging corner taken left-footed by Peter Sweeney, save by Peter Gulacsi. 79:18 Substitution Lenell John-Lewis goes off and Danny Carlton comes on. 78:08 Nicholas Ajose produces a left-footed shot from the edge of the box and misses to the right of the goal. 77:45 Free kick awarded for an unfair challenge on Joss Labadie by Tom Lees. Free kick taken by Jermaine Grandison. 77:06 Lucas Akins challenges Joe Skarz unfairly and gives away a free kick. Free kick taken by Ritchie Branagan. 76:09 Effort from outside the penalty box by Andy Haworth goes wide left of the goal. 74:49 Centre by Aaron Cresswell. 74:42 The ball is delivered by Ian Thomas-Moore, clearance by Tom Lees. 73:18 Enoch Showunmi takes a shot. Save made by Ritchie Branagan. 73:03 The ball is delivered by Kyle Bennett, Zoumana Bakayogo makes a clearance. Correction - 71:32 Nicholas Ajose fouled by Jermaine Grandison, the ref awards a free kick. The ball is crossed by Steven Schumacher, Lenell John-Lewis takes a shot. Peter Gulacsi makes a save. 71:32 Jermaine Grandison concedes a free kick for a foul on Nicholas Ajose. The ball is sent over by Steven Schumacher, Lenell John-Lewis takes a shot. Save by Peter Gulacsi. 69:39 Nicholas Ajose gives away a free kick for an unfair challenge on John Welsh. Peter Gulacsi restarts play with the free kick. 68:36 The ball is swung over by Kyle Bennett. 66:27 John Welsh challenges Andy Haworth unfairly and gives away a free kick. Peter Sweeney restarts play with the free kick. 66:27 Booking John Welsh is given a yellow card. 65:54 Andy Haworth fouled by Zoumana Bakayogo, the ref awards a free kick. Direct free kick taken by Phil Picken. 63:11 John Welsh concedes a free kick for a foul on Nicholas Ajose. Direct strike on goal from the free kick comes in from Peter Sweeney, Peter Gulacsi makes a comfortable save. 61:46 The assistant referee flags for offside against Nicholas Ajose. Indirect free kick taken by Peter Gulacsi. 58:45 John Welsh concedes a free kick for a foul on Lenell John-Lewis. Free kick crossed left-footed by Peter Sweeney. 57:07 Lucas Akins crosses the ball, Ritchie Branagan makes a comfortable save. 54:31 Ian Thomas-Moore is caught offside. Free kick taken by Ritchie Branagan. 53:50 Free kick awarded for a foul by Nicholas Ajose on Jermaine Grandison. Peter Gulacsi takes the free kick. 50:58 The referee blows for offside. Indirect free kick taken by Ben Futcher. 49:52 Foul by Lucas Akins on Kyle Bennett, free kick awarded. Nicholas Ajose restarts play with the free kick. 49:37 Enoch Showunmi takes a shot. Ritchie Branagan makes a comfortable save. 48:56 Shot from outside the box by John Welsh misses to the left of the target. 48:40 The ball is delivered by Zoumana Bakayogo, clearance made by Ben Futcher. 47:25 Andy Haworth gives away a free kick for an unfair challenge on Marlon Broomes. Marlon Broomes takes the free kick. 45:35 Marlon Broomes fouled by Nicholas Ajose, the ref awards a free kick. Peter Gulacsi restarts play with the free kick. 45:00+1:07 It is the end of the first-half. 45:00+0:31 Corner taken left-footed by Aaron Cresswell from the right by-line, Tom Lees makes a clearance. 45:00+0:17 Joss Labadie takes a shot. Save made by Ritchie Branagan. 43:54 Booking Joss Labadie booked. 42:51 Phil Picken gives away a free kick for an unfair challenge on Aaron Cresswell. Peter Gulacsi restarts play with the free kick. 42:04 The assistant referee signals for offside against Aaron Cresswell. Ritchie Branagan takes the direct free kick. 41:40 Steven Schumacher concedes a free kick for a foul on Enoch Showunmi. John Welsh takes the free kick. 41:08 Effort on goal by John Welsh from outside the penalty box goes harmlessly over the bar. 40:17 Inswinging corner taken by Aaron Cresswell, Lenell John-Lewis makes a clearance. 37:48 The referee blows for offside. Free kick taken by Peter Gulacsi. 36:55 Enoch Showunmi is ruled offside. Ben Futcher takes the free kick. 35:16 Enoch Showunmi fouled by Ben Futcher, the ref awards a free kick. Lucas Akins takes the direct free kick. 34:21 Andy Haworth sends in a cross, Zoumana Bakayogo makes a clearance. 33:19 The official flags Enoch Showunmi offside. Free kick taken by Joe Skarz. 31:59 Marlon Broomes challenges Lenell John-Lewis unfairly and gives away a free kick. Strike on goal comes in from Steven Schumacher from the free kick, Peter Gulacsi makes a comfortable save. 30:20 Corner taken by Peter Sweeney played to the near post, Lucas Akins manages to make a clearance. 28:35 Foul by Peter Sweeney on Zoumana Bakayogo, free kick awarded. Aaron Cresswell delivers the ball from the free kick left-footed from left wing, clearance by Ben Futcher. 28:35 Booking Peter Sweeney is shown a yellow card for unsporting behaviour. 27:01 Nicholas Ajose takes a shot. Save made by Peter Gulacsi. 26:08 Joe Skarz fouled by Lucas Akins, the ref awards a free kick. Ritchie Branagan takes the direct free kick. 25:30 Lenell John-Lewis challenges Joss Labadie unfairly and gives away a free kick. Direct free kick taken by Marlon Broomes. 23:24 Free kick awarded for a foul by Steven Schumacher on Joss Labadie. Free kick taken by Marlon Broomes. 22:56 Enoch Showunmi is ruled offside. Indirect free kick taken by Ritchie Branagan. 19:39 Shot by Aaron Cresswell from a long way out goes over the crossbar. 17:11 Foul by Marlon Broomes on Lenell John-Lewis, free kick awarded. Steven Schumacher restarts play with the free kick. 16:10 Inswinging corner taken by Peter Sweeney from the right by-line, free kick awarded for a foul by Lenell John-Lewis on Tim Cathalina. Free kick taken by Peter Gulacsi. 16:03 Andy Haworth produces a cross, clearance made by Tim Cathalina. 13:14 Joss Labadie challenges Lenell John-Lewis unfairly and gives away a free kick. The ball is delivered by Kyle Bennett, Header from deep inside the area by Tom Lees goes over the bar. 12:38 Outswinging corner taken by Peter Sweeney from the left by-line, Aaron Cresswell manages to make a clearance. 11:42 The ball is sent over by Andy Haworth, Peter Gulacsi makes a comfortable save. 7:33 Enoch Showunmi provided the assist for the goal. 7:33 GOAL - Ian Thomas-Moore:Bury 0 - 1 Tranmere Goal scored by Ian Thomas-Moore from deep inside the penalty area to the bottom left corner of the goal. Bury 0-1 Tranmere. 5:52 Andy Haworth has an effort at goal from outside the area which misses left. 5:26 Corner taken by Peter Sweeney from the right by-line played to the near post, clearance made by Lucas Akins. 5:11 Nicholas Ajose takes a shot. Save by Peter Gulacsi. 2:50 Andy Haworth gives away a free kick for an unfair challenge on Joss Labadie. Peter Gulacsi restarts play with the free kick. 0:58 John Welsh gives away a free kick for an unfair challenge on Peter Sweeney. Joe Skarz restarts play with the free kick.